If you want a sphygmomanometer that offers superior performance and unsurpassed quality, look no further than the MABIS CALIBER Series Aneroid Sphygmomanometer. This manual inflation blood pressure monitor is similar to those used in doctors’ offices and hospitals. It comes with all you need to start taking your blood pressure at home. It comes with a mini-screwdriver and is specifically designed so you can easily set the gauge to 0, if needed. It features a calibrated blue nylon cuff that is comfortable on your arm. Doctors, nurses, pediatricians, EMTs and other medical professionals will enjoy its professional look and style. 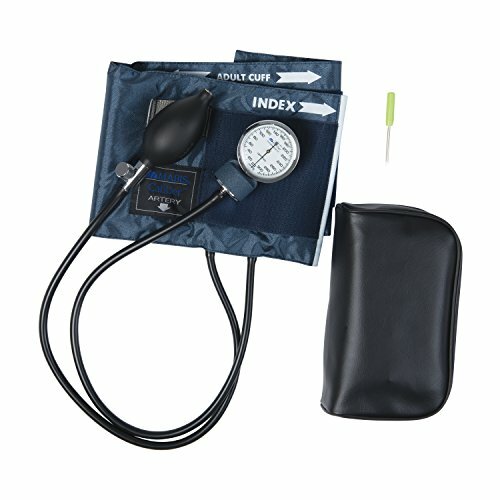 This sphygmomanometer also comes with a convenient deluxe zippered carrying case. Get professional accuracy without the need for electronics or batteries! Insert the mini screwdriver into the stem of the gauge and turn until the needle returns to 0. You will always have a reliable blood pressure monitor with this CALIBER Series Adjustable Aneroid Sphygmomanometer from MABIS. It comes with a mini-screwdriver and is specifically designed so you can easily set the gauge to 0 if needed. The calibrated blue nylon cuff is comfortable on your arm. Not only for the professionals. This manual inflation blood pressure monitor is similar to those used in doctors' offices and hospitals. Get professional accuracy without the need for electronics or batteries. This sphygmomanometer comes with a convenient deluxe zippered carrying case. View More In Patient Monitoring Equipment.